One of the features that Google's Chrome browser offers that Firefox does not is the browser's built-in translation service. Whenever you visit a website that is published in a language that you have not installed in Chrome, a small translation bar is displayed at the top of the window that you can use to translate the page into another language. You can disable the feature for any given language so that you are not bothered anymore by the translation notification. The Firefox browser has its fair share of translation add-ons, but there is none that I'm aware of currently that replicates Google Chrome's translation functionality. The extension GTranslator offered that functionality previously, but it is no longer compatible with newer versions of the Firefox browser. Note: Mozilla contacted me to let me know that there are two different translation projects the organization is working on currently. The first is called Instant Translation which resembles the Google Chrome translate feature. 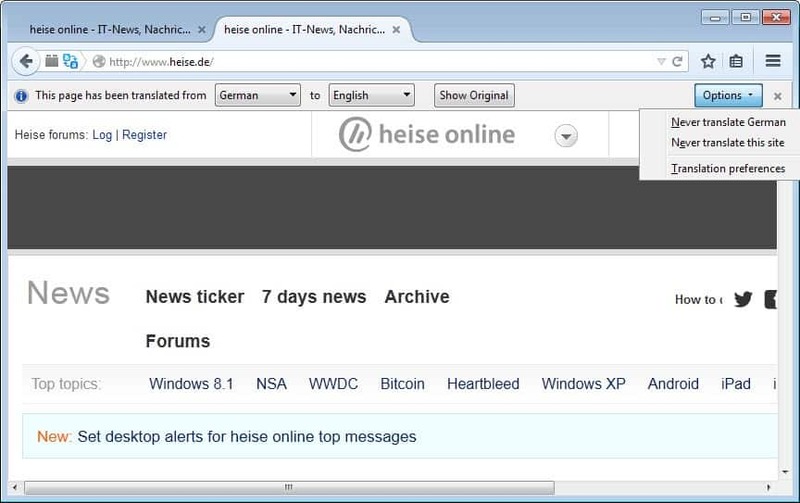 Firefox relies on a partner engine to provide those translations. Mozilla announced back in February 2014 that it made the decision to integrate native machine translation functionality to Firefox similar to what Google is making available for Chrome. The team has been working on the implementation ever since. Test builds have been created, reason enough to check out the current implementation so that you can judge for yourself how far it has progressed. The feature works similar to how Chrome handles translation notifications. Whenever you visit a web page published in a different language, the translation bar is displayed at the top. It displays the language the page is published in, and gives you options to translate the page right away. If you select the option, the page is translated into the browser's default language. It takes some time to translate the page, and when it is done, the language the text has been translated to is displayed in the notification bar. It is displayed as a menu so that you can switch to a different language using it. Only a selection of languages are supported right now including English, German, Spanish, Japanese, Russian, Italian or French. Firefox's current implementation does not support as many languages as Chrome does, but considering that the feature has not found its way to the Nightly channel yet it is not really something to worry about. You can use the toolbar to display the original text again at any time, or use the options to define permanent preferences. You can configure Firefox's translation feature to never translate a language or language on a particular site. One option that is currently missing is to always translate the selected language when it is encountered in Firefox. The translation preferences link is working but the preferences page itself is not listing any options yet for the translation service. Again, this is understandable considering that this is a development snapshot and not a finalized product yet. It is very likely the team will resolve these issues before the feature lands in any release version of the Firefox web browser. Firefox's Machine Translation feature won't use Google Translate as Google has started to charge for API access which makes the project even more ambitious as it has to find or create an alternative that matches the quality of Google's translation service. Mozilla plans to integrate a translation service into the Firefox web browser to provide users from all over the world with web page translation options. No “translate selected text only” option? That would be pretty disappointing. Is it the good kind of translation, where the browser sends the text for translation and then replaces the text within the rendered page; or the bad kind where the browser sends the url to a translation service? I hope it’s the first. This is one major feature that Firefox is missing. Translation happens on the page directly like in Chrome. So in your opinion Mozilla should not implement much requested features just because Chrome was first? Makes me think that Chrome is like the iPhone. And Mozilla never came up with anything first that Google has mimicked, and companies shouldn’t use touch screens, or push buttons, or tires on cars, etc, etc, because those weren’t their original concepts. Of course they should implement them. Square tires are the way to go. Is there an entree in ‘about:config’ to disable Firefox’s native machine translation? I am sorry to deride machine translators, but they still have along way to go. Is it is as good as google translate , it means that it is not very good. There will be a visible option in the preferences to disable the translation feature, but it’s not yet included in the current test build. Thank you. That is a relief. If there were no ‘no/off’ button in the final version, it may turn into the translator bar from hell. It is a personal choice of the user whether it is used. Some people may like it. Others may not. Once upon a time Firefox was a ‘build yourself’ browser where people made it as they wanted with themes and add-ons. Recently, it seems to be a case that many functions and themes are added by default and it is up to the user to configure ‘about:config’ to change them or install add-ons to modify the browser. For instance, we have had Australis and the proposed EME all installed by default. Personally, I think that add-ons like Stylish and ‘Grab and Drag’ and ‘Yet Another Smooth Scrolling’ are essential, but I would never advocate that they must be installed by default. Other users may not like them. For example, in the past a machine translator would be installable by an add-on, but now it is to be installed by default. The fun in using Firefox is changing things to the way one likes it. Provided that freedom exists, it is still a good browser. Incidentally, I think that the user ‘Billy’ in the comment below was stressing the word ‘imperfect’ in the comment about nobody wanting a translator. At the end of the day machine translators are limited and by choice nobody wants to have an imperfect translation. However, the technology has not advanced to that stage of perfect translations. In the absence of a compulsory world internet language, it is a case of “making the best of a bad job” when one is dealing with machine translation. EME will be not really installed by default, the user has do download the Adobe Content Decryption Module (CDM) manually and no CDM means no EME in Firefox. The same applies for the Open H.264 codec, the user will have to download it, it will not be installed by default. Australis was an interface change. A browser can only have one default interface and not everybody can like it. I know no other software asking you wheter you like it or not and provice an alternative default design. ;) But there are a lot of themes and add-ons for Firefox, so it’s less a problem than with other software, you can just customize Firefox. And these customizing possibilities are built by Mozilla, Mozilla created the APIs for add-on developers, so Mozilla gives you the choice. Firefox is more customizable than any other browser. This is one more Firefox misconceived improvement which results in bloating the browser folder. Nobody wants a machine translation which is imperfect. I assume that if it not disabled, it will scan the pages of every website visited and then give you the option to use it. It will drain memory and CPU resources. If there a file in the Mozilla folder which contains the Firefox’s native machine translator, that can be deleted to save space. I anticipate that the file may be quite large. I can’t wait to disable the machine translator and delete the file if I can. Nobody? I know more than a few people using Chrome and not Firefox for only one reason: because Chrome has an built-in translator and Firefox not. True story. However, Firefox should be a little more original. The pop-up bar is identical to Google. Also, teaming up with Microsoft Bing is a little controversial. Firefox invites opposition from its users. Can firefox use bing translation engine? Firefox uses the Bing translation engine. I do not know the answer to your question. ◔‸◔ However, your question is a very good question. A translator installed by default in Firefox needs to be better than the other existing translators. There already seems to be no shortage of machine translator add-ons for Firefox. If it only uses the Bing Translator, it is limited choice. If it can be customised to use other machine translators, that is probably a better option for some users. Currently I use the S3.Google Translator add-on. Based on the sheer number of existing Firefox translator add-ons, why do users need a built-in machine translator? Any Firefox built-in translator needs to be far superior to the existing add-ons to justify its inclusion by default. What are the unique points about this machine translator? I am not being over critical, but I am curious. b) It does not support as many languages as Chrome does. c) One option that is currently missing is to always translate the selected language when it is encountered in Firefox. d) The translation preferences link is working but the preferences page itself is not listing any options yet for the translation service. e) Firefox has to find or create an alternative that matches the quality of Google’s translation service. f) At the moment there is no ‘on/off’ button. However, it is still in the development stage. It may end the same way as the Shumway project. That started in 2012 and is still not installed by default. But what if Microsoft decides to place a money lock on their Bing Translator like Google did to their translation API? You have to ask Mozilla. ;) I don’t know the “business details”, maybe Mozilla and Microsoft have an agreement, maybe not. I use two different addons for my translations – ‘gTranslate’ to translate selected text and ‘Wiktionary and Google Translate’ for my page-translation requirements, which are pretty frequent. I have all the ‘Wiktionary’ related options disabled ‘cuz they’re mostly annoying with pop up bozes popping up everywhere, but the page translation feature that the addon provides is simple and unique that I couldn’t find anywhere else. It does exactly what it says on the box – nothing more, nothing less. Just right click on the page and choose “Translate Page” from the right click context menu. Simple as that. P.S. – You need to enable Flash on the page (temporarily) for the page translation feature to work if you’ve enabled ‘click to play’ like I have. How does the translation offer is triggered? Does it send your URL to a server, compare URL to list of language database or some sort of language algorithm? Mozilla implemented the Compact Language Library of the Chromium project in Firefox. So? Whatever happened to this? Did they abandon it like most useful additions to implement some garbage instead? Nope. It’s implemented and you can enable it via about:config. You need an API key to use it. It’s just not enabled per default. I don’t know details but the usage of the translation API is very expensive. So it’s implemented, but useless because the lack of services? Not, it’s not useless and there is no lack of service, you can chose between two different services (Bing and Yandex). But you have to get your own API key. Then I don’t understand how does a minor Chrome fork like Slimjet have the built in webpage translator. By the way how can I enable it and change engines? > Then I don’t understand how does a minor Chrome fork like Slimjet have the built in webpage translator. Chrome is from Google. The Google Translation API is from API. Google don’t need to pay for the own service. Mozilla doesn’t have a own translation service. They have to pay. > By the way how can I enable it and change engines? Set browser.translation.ui.show to true to enable the visible UI in the preferences. There you can enable the feature. You need an API key and secret. Then you can set it via browser.translation.bing.clientIdOverride and browser.translation.bing.apiKeyOverride. To change the engine from Microsoft to Yandes set browser.translation.engine from bing to yandex. Then you need browser.translation.yandex.apiKeyOverride for the API key. I didnt’ test it with a stable release of Firefox and didn’t test it with the current Nightly version of Firefox. My last test was with a Nightly version of Firefox 41 in June 2015 (I wrote an article about this feature in June 2015, otherwise I wouldn’t know when I tested it). Which is most definitely not a google product. It’s based on Chromium. Thanks for the about:config settings. But if they’re sooo expensive I guess the makers of slimjet a browser with an immeasurably small market share are just full of money, because google translate just works there out of the box….